During the last days of April Pia and Peter Cerveny, directors of the Karmapa Healthcare Project, visited the north west of the UK to inform about their work and share some of their videos documenting the activity of our Asian and Western teachers. One video for instance retold events at the Kagyu Mönlam, the annual meeting of Karma Kagyu masters and practitioners at Bodh Gaya in India, guided by H.H.17th Karmapa Trinley Thaye Dorje. Thousands of monastic and lay practitioners join in making wishes for the benefit of beings around the globe. Pia and Peter came to the north west at the invitation of Lama Jampa Thaye and used the opportunity to meet friends at the Liverpool Diamond Way Buddhist Centre on Sunday 25 April. 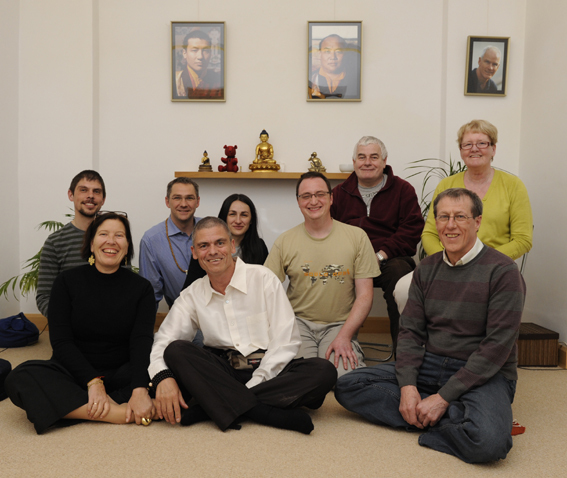 On Tuesday 27 April they had a successful meeting at Kagyu Ling in Manchester, in the presence of Lama Jampa Thaye. The Karmapa Healthcare Project was founded in 2005 by Karmapa Trinley Thaye Dorje from the initiative of Pia and Peter Cerveny from Germany. Since then the project has been supporting the development of a modern healthcare system for the institutes of Karmapa, Shamar Rinpoche and Sherab Gyaltsen Rinpoche. This entry was posted on Wednesday, May 5th, 2010 at 9:50 am and is filed under Diamond Way Buddhism. You can follow any responses to this entry through the RSS 2.0 feed. You can leave a response, or trackback from your own site.